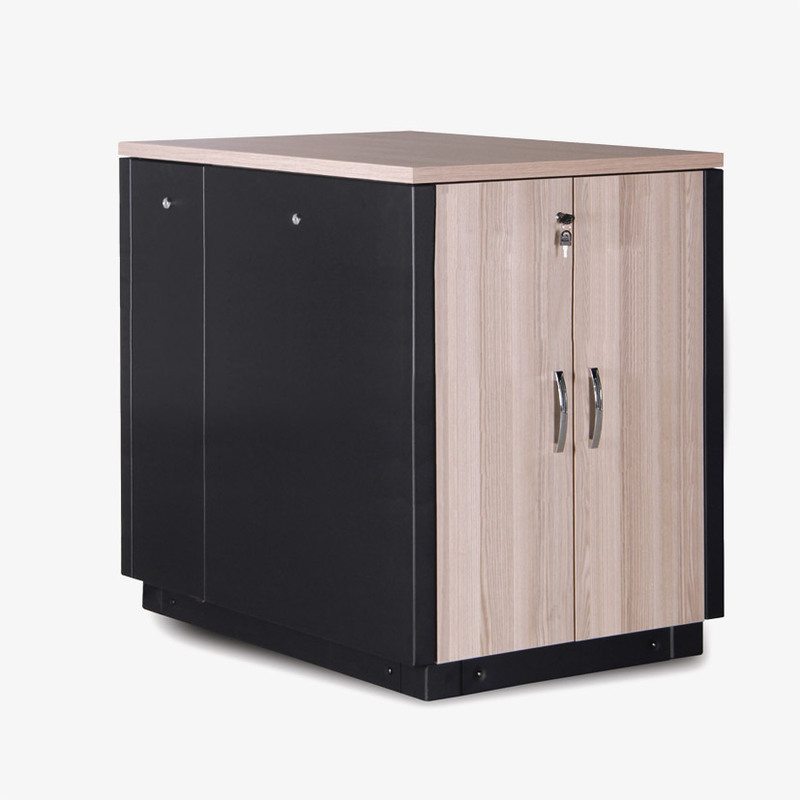 An elegant solution where noise levels and visual appearance are important, the ES420 Series acoustic cabinets are lined with melamine sound absorbing foam to reduce noise and to aid thermal performance. 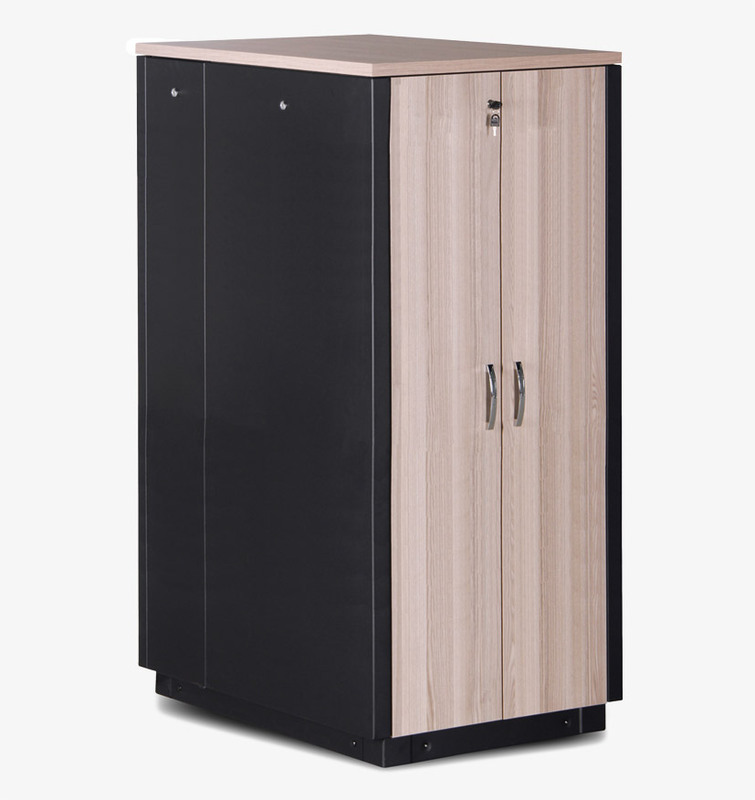 The bolted steel construction gives strength and rigidity; the maple-veneered particle board front-door and top vanity-panel suit the decor of studio, educational, corporate and commercial environments. The cabinets are available in three heights, 17U, 32U and 42U. 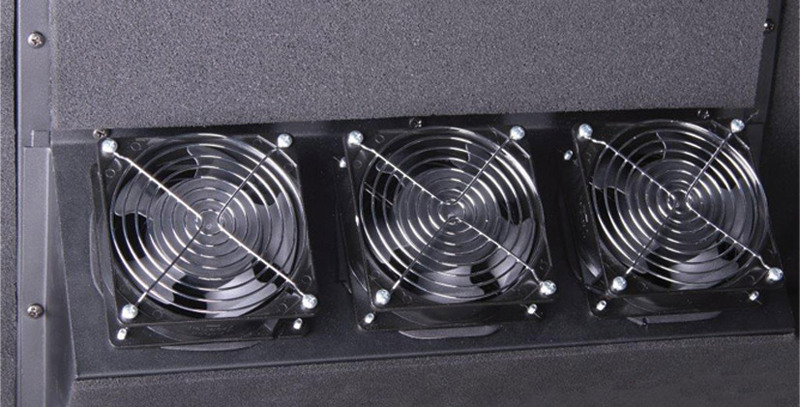 A fan module, levelling feet, castors and vertical cable-management are included. The cabinets are supplied assembled. All models are 750mm wide and 1130mm deep. The top of the rack is connected to the base by six pillars forming the frame of the rack. Front and rear mounting-profiles fix to flanges on the top and base frames, and are adjustable through the depth of the cabinet. The mounting-profiles have two sets of perforations to take cage nuts, to fix equipment both in the open faces of the rack and accessories, such as shelves and chassis guides, inside the rack. The 1U increments on each front face are screen-printed with 'U' height measurements to aid installation. 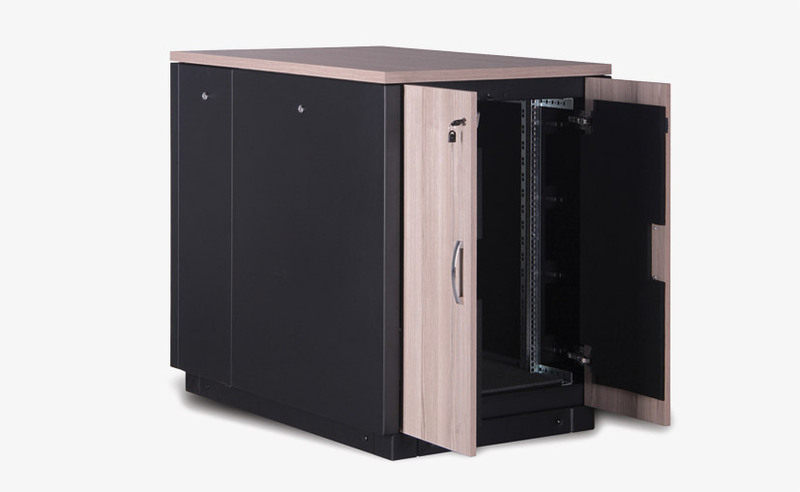 At either side of the mounting-profiles, the cabinets have a double-skin side structure, with split, lockable access-panels, offering considerable space for cable routing. To the front of the side-structure are aluminium rings and large brushed-apertures, alternately-spaced through the full height of the cabinet, to aid in cable management. The larger side-panel can be removed to gain access to the cable-management channel. At the rear of each side-structure, a dedicated surface is available to mount power distribution units (PDUs). On 17U models, a 19-inch PDU can be vertically mounted; for 32U and 42U models, two 19-inch PDUs or one 32U or 42U PDU can be vertically mounted. 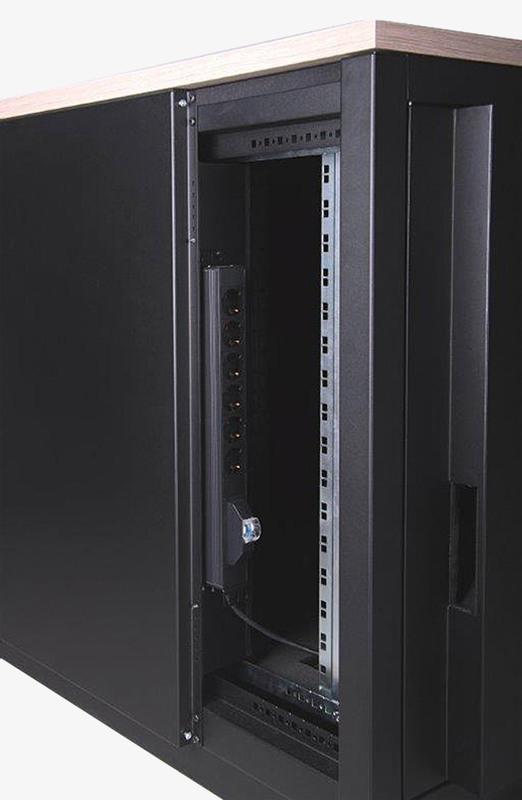 Access to the PDU is achieved through the smaller side-panel. Note: 19-inch PDUs with rear cable entry cannot be installed vertically. All doors fit flush within the cabinet; the front door consists of two 'wardrobe style' maple-veneered doors. 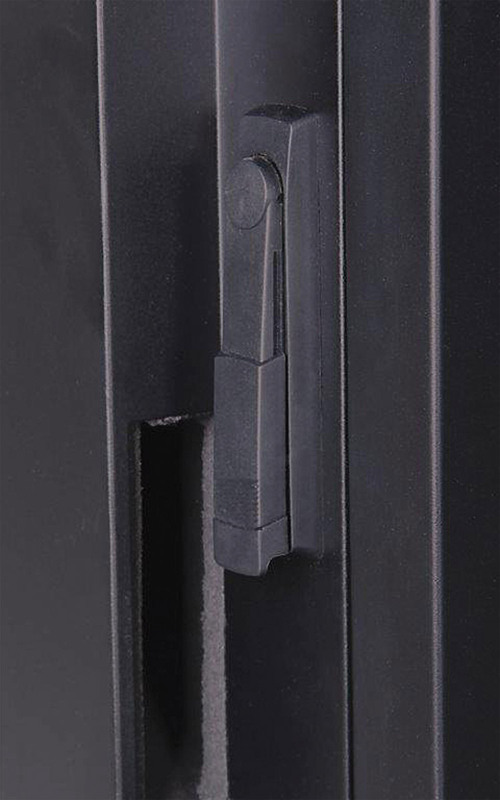 A single-point cylinder lock provides security, complete with a handle on each door. To the rear of the rack, a full height, double-skin steel door, with hot-air exhaust apertures, is fitted, complete with single-point lock and handle. On the inner-face of the rear door is a three, six or nine-fan module, depending on model, complete with thermostat. The thermostat may be set between 0-60 degrees C. Power source: 220/240V AC, 50/60Hz, 7/8W per fan. Power is connected to the module via a captive, unterminated, 2.5 metre cable. A maple-veneered vanity panel attaches to the top frame from the inside, to improve appearance. The bottom frame includes a large 250 x 150mm cable-entry point, with an integrated, rubber-edged, sliding-plate to hold cables in place and prevent dust ingress. Racks are supplied fitted with heavy-duty castors and levelling feet, 1000kg maximum load per set of four. Noise reduction is achieved with 20mm, non-flammable, zero halogen, anti-fungal melamine foam, compliant with BS 476-6 Class 0 and BS 476-7 Class 1. 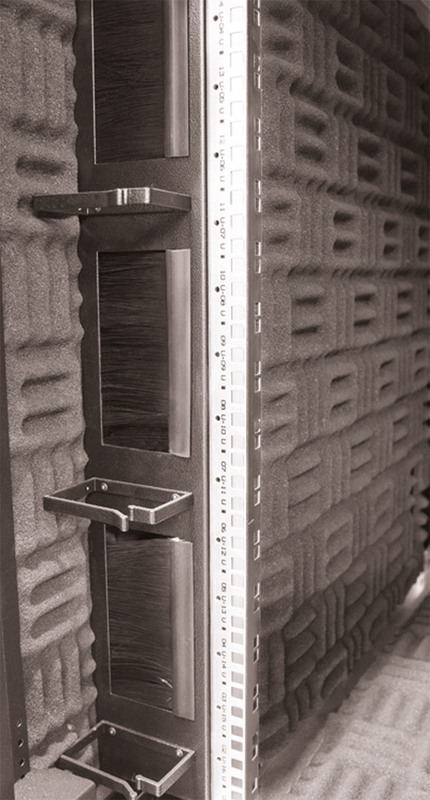 The foam is effective with a wide spectrum of sound frequencies. The internal surface of all panels and doors are lined, including both levels of double-skin panels. Note (1): Height includes levelling feet and castors. Maximum depth for equipment: 745mm. Finish: Frame: Black, RAL 9005 powder coat. Wood panels: Maple veneer. Mounting profiles: 8-12 micron zinc plated. Optional accessories: See Canford Racks - Accessories - Hardware - For ES420 Series for hardware such as chassis guides, shelves, earth kits and horizontal cable-management. Additional shipping surcharges may apply for non-UK delivery addresses.